We just finished our Speak your #Soultruth urban retreat last Sunday. It was the easiest of the four urban retreats we’ve done this year; and we say this with immense gratitude, humility and joy. It was easy because we decided that retreats like this where we dive into the depths of our souls, should be filled with spiritual joy and fun! But we didn’t always think that. In fact, we often expect the truth to hit us like a ton of bricks, a tidal wave, a lightning strike, an AHA so earth-shattering that our lives will be changed forever and ever because of this awakening. Tay once went into the Amazon forest to do just that – to seek a life-altering awakening that would cleanse her soul and set right her path forward. After a month of sheer pain, turmoil, and suffering, she arrived at the same answer she had always knew before she went into the forest. So we told ourselves, if we were going to get to the top of the mountain, we shall take the easiest path, and we’re going to skip and sing our way there. We’re going to take the path of most inspiration and least resistance. We held this precise intention for ourselves and for our attendees at the retreat – to embark on the path of most inspiration and least resistance – to recognize the truth because it’s the most natural thing to do, to have a ton of fun and laughter in the process, and to allow the truth to be spoken in a way that it’s easily understood. As a result, we completely stop efforting – before, during and after the retreat. And being the over-achieving perfectionists that we are, it ain’t easy. When our original perfect venue had an ice-cream festival (think huge crowds and blasting music) downstairs on the same date as the retreat – we had to find another venue, and stop trying to make the venue more perfect than perfect. When our original chef couldn’t cater to us last minute – we had to create the harvest table ourselves, and stop trying to make the already organic, gluten-free, process-free food more nourishing than nourishing. 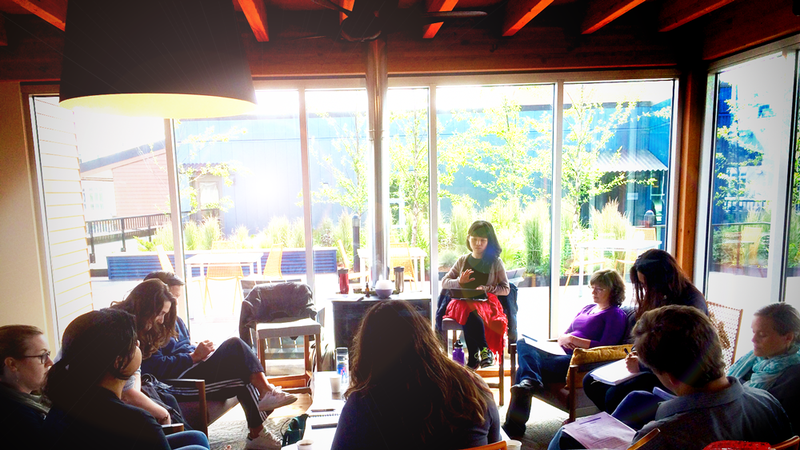 When we landed ourselves in a beautiful roof-deck clubroom with glass walls and doors all around – we had to teach our attendees how to create their own safe space energetically, and stop trying to make our attendees feel safer than safe. We did. We got out of the way. And everything fell into place. Holding safe and sacred space became effortless, as attendees shared their experiences, learnings, and breakthrough generously and freely. As teachers and facilitators, words flowed out of us without the usual 3 rounds of censorship in our heads. Instead of figuring out the most impressive vocabulary to impressively address something; we shifted into being in full service of the attendees and let the truth be witnessed. This, was what it means to “Speak Your #Soultruth” – to truly listen, and then cultivate a path towards true eloquence. It was also what we anchored and ended the retreat with. As the day ended, we saw soft smiles and clear eyes on bright faces. The air was light and bright. There was a general sense of openness and ease throughout as each of us came home – to ourselves, our stories, our #soultruth. We’re celebrating this understanding, this sense of familiarity, this home-coming by sharing our experience with you. And if this home-coming experience speaks to you, we’re inviting you to join us for the next retreat, Ignite Your Intuition.